Pakistan’s Chief of Army Staff to meet U.S. Generals to discuss November NATO incident; Pakistani opposition leaders resistant to recommendations on U.S.-Pakistan relations; Rep. Dana Rohrabacher alleges that Pakistan has “radical Islam[ist]” government; Two major U.S. oil companies interested in TAPI pipeline; German embassy employee found dead in Islamabad; Unidentified assailants blow up gas pipeline in Peshawar; German-Afghan man on trial for being part of al Qaeda claims innocence; Indian Prime Minister meets with Prime Minister Yousuf Raza Gilani; Leaked letter describes weaknesses in Indian military; Delegation of Pakistani defense and security officials meet with French counterparts; Pakistan’s Supreme Court to hear Hussain Haqqani’s petition to record his statement via video link; Yemen urges Pakistan to release Osama bin Laden’s widow and children. According to a senior advisor to the Special Envoy for Eurasian Energy in the U.S., two “major [U.S.] oil companies are interested” in the Turkmenistan Afghanistan Pakistan India (TAPI) pipeline. The proposed pipeline is expected to transport natural gas from Turkmenistan’s gas fields through Afghanistan into Pakistan and then finally to India. 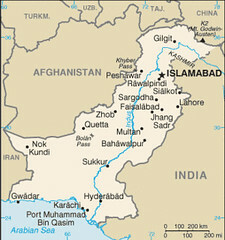 The governments of the four countries are planning to finalize the TAPI pipeline deal by July 31, 2012. The Express Tribune reported on Wednesday that police recovered the bodies of a German embassy employee and one other unidentified person from Rawal Dam in Islamabad. The employee, Fayaz Ali, had been reported missing by his family on March 22. According to investigators, the dead bodies were four to five days old, but investigators have still not determined if the two men were murdered. Unidentified assailants blew up a gas pipeline on the Ring Road in Peshawar on Wednesday morning. No casualties were reported from the explosion. A German-Afghan man on trial in a German state court for providing funds to al Qaeda claimed on Tuesday that the funds were not intended for terrorism. Ahmad Wali Siddiqui had previously told the court that he lived in an apartment in Pakistan near the Afghan border that was provided by al Qaeda, but he was not an al Qaeda member. On Tuesday, Siddiqui testified that he transferred money from Hamburg to an al Qaeda contact in Pakistan in 2010, but he said that he never saw the money again and that it was intended for his own expenses. A policeman was killed and another was injured when unknown gunmen opened fire on the home of a Shariat Court judge in the Mumtazabad area of Multan on Wednesday. A letter addressed to Indian Prime Minister Manmohan Singh describing the weaknesses of the Indian armed forces was leaked on Wednesday. The letter written by Army Chief General VK Singh and dated March 12 states that India’s “major (fighting) arms” are in an “alarming” state. According to the letter, the army’s tank fleet is “devoid of critical ammunition to defeat enemy tanks,” the air defence system is “97% obsolete,” the infantry is plagued by “deficiencies,” and the elite special forces are “woefully short” of “essential weapons.” AFP reported that the publication of the letter has “up[ped] the stakes in a public battle” between General Singh and the Indian government. A delegation of Pakistani defense and security officials led by Defence Secretary Nargis Sethi was in France on Wednesday, holding discussions with their French counterparts on matters related to security cooperation and enhanced bilateral contacts. Sethi said that “Pakistan enjoyed excellent relations with France,” and it wanted to transform those relations into “a long-term partnership” that would benefit both countries. Pakistan’s Supreme Court will hear a petition on Thursday filed by Pakistan’s former Ambassador to the U.S. Hussain Haqqani, which was previously rejected by the “memogate” commission. Haqqani has requested permission to record his statement in the memogate case via video link from London, citing “grave security concerns” if he travelled to Pakistan. This entry was posted in Al Qaeda, Asia, Middle East, Politics, Reports, Security, Terrorism, War & Conflicts and tagged Al Qaeda, Dana Rohrabacher, Islamabad, NATO, Osama bin Laden, Pakistan, Pakistan-US, Tuesday. Sudan – a ‘Kosovo’ approach to Abyei and Nuba?